I know last week I said my tablescape was a hodge podge, but I think this week I topped the hodge podge of last week! When I decided to do a St. Patrick's Day tablescape, I started grabbing everything I could find that was green. One thing led to another, and I've ended up with ANOTHER hodge podge table (can you believe spell check doesn't recognize "hodge podge"-of course it also doesn't recognize "ya'll"!--I think we need a Southern version of spell check!). The plaid plates remind me of a kilt, so that is how (in my hodge podge mind) I justified using them on the St. Patrick's Day tablescape. Of course, at Christmas time, they remind me of Christmas, and on other occasions, they remind me of something else-I'm not sure what, but I am sure I've used them at other times). See those leprechaun bumble bees on the table square? That's what made me think I could use a yellow tablecloth, yellow napkins, and a bucket with bugs on it. (My brain tends to tie things together in strange ways - this may also be referred to as Laurie justifying putting things together that don't match one another). I'm sure ya'll have figured out that the reason I love to use mug trees for centerpieces is that they are inexpensive (so much nicer than saying cheap). You can find these mug trees (and measuring spoon trees, which I've also used in centerpieces) for a quarter at junk stores. I've never used one for mugs or measuring spoons. Maybe NOBODY ever has, and that may be why I always see them in junk stores. Tuesday Morning sometimes carries these "smokers" (I think that's what they are called). I often buy them on sale after Christmas, but since this one is an Irishman, he gets stored with my St. Pat's decor instead of the Christmas decor (well that, and the fact that there is not one one more inch of space left on the Christmas storage shelves). Of course I have a leprechaun with a pot of gold. I'm just hoping that he is going to find me a real pot of gold some day (Every St. Pat's Day, I say to him [in a whisper, so my family won't have me committed] "sweet little green guy, if you bring me real gold, I promise I'll share it with you"--so far I've had no response from him, but I still hold out hope). The mug tree holds more leprechauns and a vintage bridge tally that my mother had saved. Since I ran out of St. Pat decor to hang on the mug tree, I got out this vintage costume jewelry that belonged to my grandmother to hang on the tree (well, it IS green-don't you just love how good I am at justifying? ), and beneath the tree is a gold shamrock with mine and my dh's initials engraved on it. This was gift from my childhood friend, Melinda. I just love anything that has a wonderful memory attached to it, and my memories of my friend Melinda are certainly wonderful. I'm sure there are frogs in Ireland! (Of course my justification for using the frog pitcher is that he is green). The tea towel under him was a gift from my sweet sister in law, Brenda. I snapped this picture before I took any other photos of the table, because I knew I'd start eating those Ande's chocolate mints before I finished photographing the table. I love those things. (I put them in little St. Pat cups, for my guests to take home-I'm re-thinking that now though). Be sure to go to Between Naps on the Porch, and see the links for all of the wonderful tablescapes. And, now that you've seen just how hodge podged (I'm sure the past tense of hodge podge is not in spell check) your tablescape can be, please join in next week. 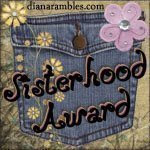 Two of the sweetest bloggers, with two of the "bestest" blogs have given me the Sisterhood Award. If you haven't visited Carol at Carol's Heirloom Collection and Miss Laura Lu at Hidden Promise, you really need to go see them. Carol has the most precious new grand baby whose pictures are currently posted on her blog (and probably many more to come-you know how we grandmothers are!) Laura Lu hasn't been blogging long, but you wouldn't know it to see her wonderful blog. A lot has been said about this award by other bloggers, and I don't think I can add to it. However, I do have to agree that Blogland is filled with a wonderful sisterhood of women, and I feel so blessed to have found this sisterhood and to feel so welcomed and accepted by this sisterhood. Thank you so much Carol and Laura Lu for honoring me with this very special award. Now, at the risk of making this post WAY too long, I just have to tell you about Kathy (Life in the Slow Lane). She is the s-i-l of my friend, Susie, who so graciously welcomed us into her home and her Valentine's party on my blog. Some of you have already met Kathy. She has had a blog for awhile now, but she has recently joined our great sisterhood of bloggers. She is a very talented lady, and if you are not already a regular visitor to her blog, you should run right over to see it here. you are a "special" lady that just makes me laugh with about everything you say...you are great. Now where is my Kiss me I'm Irish button??? Hey, Laurie. Thanks for the free advertising. I do think you must have a much holiday stuff as Susie. I remember when they moved from Virginia to Conway, they had to have a second moving van just for her decorations. P.S. When the weather figures itself out, I'm serious, I'm coming to your town and you're going to show me the great places to bargain hunt! Think of the blog posts we can make!!!! Laurie Eve, it's not even Mar 1st yet, and you are all ready for St Pat. That was darling..you asked us "what do I think about the favor"?.. GM Laurie...now girl where's my corn beef at?? All of this and all I get offered is a mint...come on get out of the BOSS's bed and do me a dinner here girl!! Cute, cute, cute. That is an adorable table. Laurie! Look at you! This is marvelous! I don't know anyone who has St. Patrick's Day table things and you do! This is darling! I wanna come over! There are various reasons why I love this great tablescape. Not the least of which, your words gave me a good little ol' chuckle this fine morning!! Great tablescape and great story telling!!! That frog is adorable. I love the tablecloth..and those cute bees in the shamrocks! Love your plaid dishes.This is perfect for the St. Pat's potluck! Love your Irish/Scottish tablescape today ~ even though it's hodge-podgish! A dear friend of mine, no longer here, loved all things Irish - traveled often to Ireland, attended Notre Dame football and basketball games, loved Digger Phelps, drank lots of ale, could belt out the Notre Dame Fight Song anytime/anyplace AND her ashes rest somewhere on the Notre Dame campus! Here's to you Miss Peggy!!!!! Thank you Laurie for giving me time this morning to remember her. What a great tablescape! It actually makes one happy looking at it! Your ideas are great. I have yet to design a tablescape. I don't think I have enough "stuff' to create. But I do enjoy looking at all those creative gals and their tablescapes. You are WAY too modest! This is one of the best tablescapes I've seen! However, your sweet comments have prompted me to at least think about possibly trying to perhaps maybe one time in the near-foreseeable future.....give it a whirl. Laurie, let me first say that I loved what you wrote in the very beginning of this post. That was so sweet of you making other bloggers feel comfortable about joining in with TT or anything for that matter. We all have things to share and ideas to pass along. You are a dear person. Yes, your "hodge podge" tablescape as you call it is adorable. You truly are so creative. I immediately thought of kilts when I saw those plaid plates with the green around it too. How creative to use those at Christmas and now at St. Paddy's day! Brilliant! I love your silverware too. It was all very fun...ummm, love those Andes mints too! Lastly, thanks for stopping by and giving me such compliments on my tablescape today. I appreciate your nice words. That is so funny you have my same baby plate! Hey Laurie! What a fun table. I love that tree in the center with the cutest little things hanging from it. What a great idea to hang jewels from it! Vintage no less. You always have the neatest ideas...so creative....we need to visit and go for coffee! How far away are you from S. Calif? Big smile....ok blogging will have to do then. Laurie your table is always decorated so nice. You are one creative lady!! Well, girl....don't cha ever run out of ideas or plates?!?! BEAUTIFUL table! i think the andes chocolates are a WONDERFUL thing to take home! Thank you so much for AlL that you share! :) Have a GREAT day! Wow it's looks great. I love it. I don't think it's a hodge podge of things it all comes together in the end. ps could you pass one the Andes mint cups over here please?!? Lovely St. Pat's tablescape, Laurie. Hodge podge is not Southern; I use that expression too, and I'm a Yankee. I'm so glad that you stopped by...and thank you for your sweet, sweet comments!!! You're always so sweet...I love when you come by! I hope that everyone isn't getting sick of my frenchy studio/office yet...I sure am having fun! hehe!!! Well my friend...you have turned out another marvelous table!!! You're so talented and creative!!! I love your St. Pat's tablescape...it just looks like so much fun! I love that tablecloth...those little bees and four-leaf clovers are darling! And I must say, as soon as I seen your photos...the first thing I thought was how perfect the red plaid plates are...whenever I see red plaid...I always think Irish/Scottish!!! I love it all...I'm going to have to get me a mug rack...I think that's a great idea for centerpieces!!! I always get so many great ideas from you, my friend! So adorable...love the festive feel of the table....but OH how I love those plaid plates!!!!!!!! What fun your St. Pat's table is. I love the plaid with it. You have such great economical suggestions for centerpieces, etc. I appreciate the tips. Enjoy!! Not hodge podge at all! You are so funny and very creative. I love how you pulled everything together. My mom LOVES LOVES anything Irish (Irish ancestors) a has a collection of Irish stuff I may have to use. She would so love being a guest at your great tablescape. Thanks for the idea. Running late this week visiting blogs....again...LOVE the ST Patty table...gorgeous!!! Seriously, that tablescape is so lovely. How clever are you, to mix and match all those seemingly different things together, and make them look like they were made to go together. That's what I call true creativity. Don't work too hard, and I'll look forward to a visit from you to BzPlace whenever you have the time. A Southern version of spell check would be nice! Hi Laurie! Please come by my Foodie Friday post - I have some special for you. You are so creative!! I love those plates, and that cute little leprechaun. 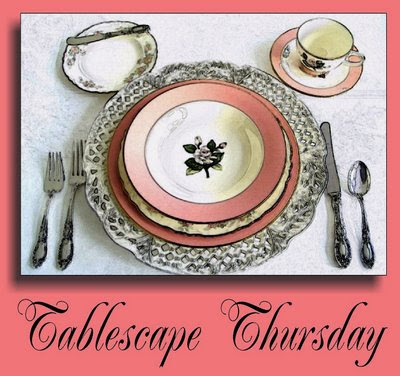 Thank you so much for this joyous and fun blog on Tablescape Thursday. You made me laugh, and made me feel braver about posting my own humble table scene! There's a giveaway on my blog today,if you have time stop by! I really enjoyed your blog and will be back. I love your hodge podge scape! I love everything! You are too funny..."if it weren't for Tablescape Thursday, I'd have nothing to post." Sometimes I feel the same way! I loved the tour--both visually and verbally, lol! You are so creative! I love your table, just wonderful! I love the frog, the cloth, the gold, the bees, the everything! A mug tree in a can! I should have known you would find something to do with it, and its great!!! I have a metal one I saving for something! Now I know what I can do with it! lol Girl, this is just great! MOrning, Laurie! You're so welcome on the award. You DO deserve it! You're awesome with everything! I still need to go back and read all the comments to see if anyone had the same thought as me. If they did, it will just be said more than once. Any table this cleverly put together needs no justification. I think your use of the mug trees is a genius idea. I am always trying to find uses for things I already own or acquire that the inventor or manufacturer never dreamed of. The more uses I can find for an item, the more I can "justify" acquiring it in the first place. I really believe our "gold" in this life is our family and our love for them. Your pot is already overflowing with all the people that you love and that return that love. Well..well...your tablescape is just fabulous!! Perfect St. Patrick day setting! I just loved all the little details, and whimsy and colors...well I mean green!!LOL! Stop by my blog for a little something I have for you on my 2/24 post under friends. Have a blessed day!! You sure do display some of the most creative tablescapes in Blogland! I just adore this one and all the festive Greens. The little leprocan and plates are just too cute. Come and check out my new blog makeover if you have a moment. Wow did I have mail today. Thanks again for your support. I just feel so much better, too. Your green tablescape is so cute....... I should go buy a shamrock or something. Here, we eat off paper plates, and sit on the couch. I say I, I mean me. They are called, no fuss lunches . Our temperature dropped 25 degrees today. It was almost 65 this am, and it's now in the low '30's. Another front, but Sunday is March 1st and it's my daughter's birthday. She missed leap year by 5 hours.We will plan something. So glad that you stopped by and took a peek at my ebay ironstone bargain...I know, I just couldn't believe that I got the whole shabang for just $10! After I bid on them, I worried that the seller might not be on the "up and up"...since no one else bid on them and they were so cheap! Whew...glad it worked out! hehe!!! So what are you up to this weekend, Sweetie...got plans? It's pretty quiet here...no kids and Russell's busy out in the shop! Your tablescape is wonderful! I love everything about it. It is very creative. Miss Laurie~ What I adore about ALL your tablescapes is your inventiveness! You have a talent for pulling random items together to create the perfect theme. The Academy Award table....with those plates and stickers provided the ambiance for the Oscar night. I would have panicked, hitting every store imaginable looking for movie themed dishes. My laptop has been out of commission. I had to wait for my son to fix it. Which took him all of five minutes! I waited several days for that quick fix. Somehow my Hubs and son's didn't see the urgency in fixing it for blogging. Go figure. Good Morning Laurie, stop by I have some awards for you, if you wish.